This loveable Talavera reindeer in the laying down position (in an assortment of colors and designs) makes a great addition to your southwest Christmas décor. 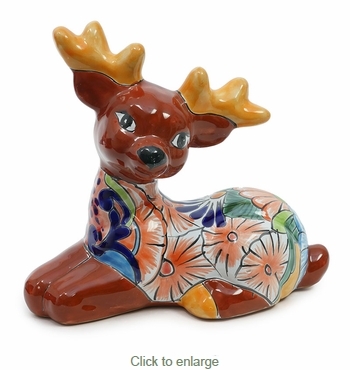 Our Talavera reindeer statues are all handmade and hand painted in Mexico. Our Talavera reindeer are also available in standing or sitting postitions, see below.